I was impressed by the thoroughness of the things they came up with, and even more impressed when we started to talk about why a farm needs these different things. When I asked why a farm needs scarecrows, one student said, “So it looks like a farm!” I couldn’t argue with that. At first they weren’t really sure why farms needed tractors, but we eventually we figured out that tractors pull tools that do different things, like plows, and that farms need these tools to prepare fields and plant seeds. Then we started talking about plowing – what it is and why we do it. Many non-farmers, not just fourth graders, probably don’t know exactly what plowing is all about, so I thought I’d explain some of the tasks we do with our tractors to get fields ready to plant. Here’s the basic idea: Wherever there is bare soil, plants will grow. Sometimes farmers deliberately plant seeds, sometimes there are “weeds” instead. Grass happens to do a very good job of establishing itself and crowding out other plants. If you drive through our farming district in the Snoqualmie Valley, you will see lots of fields of grass. If we want to plant something besides grass, like vegetables, for example, we need to do something to turn that grass into soil. As I discussed with the students last week, if you just plant a carrot seed in the middle of your lawn, it probably won’t make a carrot. Grass roots soak up most of the water and nutrients in the soil, but even worse for a carrot, the grass shades the little tiny carrot sprout from the sun, and without sun, the carrot can’t grow. OK, so we know that we need to get rid of the grass. What can we do about it? As another group of students has recently learned on our farm, you can use a sod-cutting machine to undercut the grass, roll it up, and move it. In our newly built greenhouses, that’s what we did. 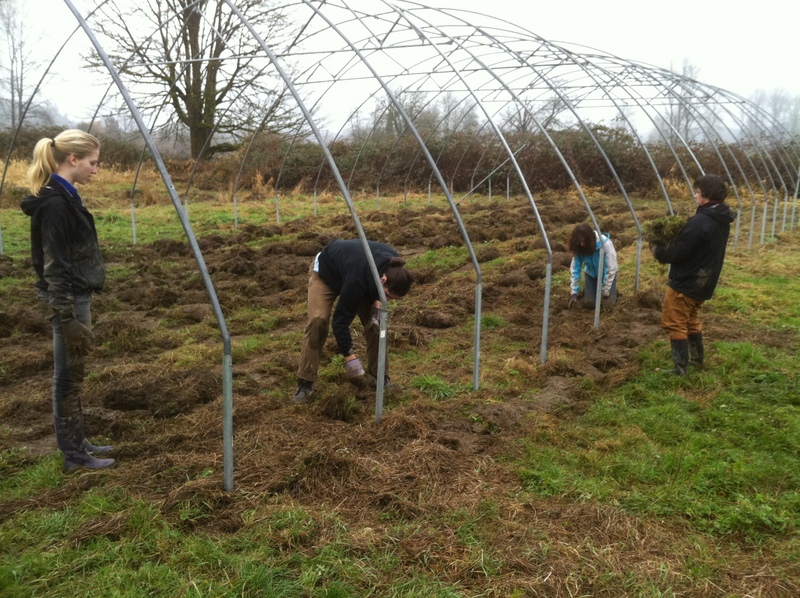 We want to quickly turn the areas in the greenhouses from grass into soil where we can plant some early spring crops, and we had two crews of high school students from Global Visionaries help us with this task earlier this month. When we asked them what they had learned in their day on the farm one of them said, “grass is heavy.” Especially true when it’s attached to an inch and a half of soaking wet soil. High school students moving heavy sod. Thanks Global Visionaries! So that’s one thing you can do to get rid of grass. But it’s not particularly practical when you want several acres of soil to plant vegetables. That’s where plowing comes in. The plow is one of the most ancient agricultural tools – if you sharpen a stick and drag it through the ground at an angle, you can create a sort of curve, or wave, that turns over on itself, exposing the soil below, and inverting whatever was on the surface. That’s still the basic idea behind plowing, but now we use big tractors that can pull several metal plowshares at a time, turning over soil many inches deep. Farms of our size often hire someone to do this job, because it takes a tractor much bigger than any other job we need to do on the farm, and plowing typically only happens once a year or less. Plowing in the 21st century. No oxen. Once a field is plowed, it’s best to let it sit undisturbed for a couple months. The buried grass takes a long time to die and break down, and we want to make sure it stays hidden from the sun so it doesn’t continue to grow. Plowing leaves pretty big waves in the surface of the field, so before it’s ready to plant, there are several other tools that the tractor uses to level and prepare the soil. The first step is disking. A disk acts a little bit like a rake, dragging across the uneven plowed surface, catching the soil at the highest points and depositing it in the lowest points. We usually disk across a field in two perpendicular directions, leveling and smoothing the surface more with each pass. Disking beside a large cedar stump. Then, we’ll usually use a tractor-mounted rotary tiller to prepare each five-foot wide bed for planting. The tiller breaks up any clods of soil on the surface into crumbs that are small enough that a seedling can push through them as it germinates. 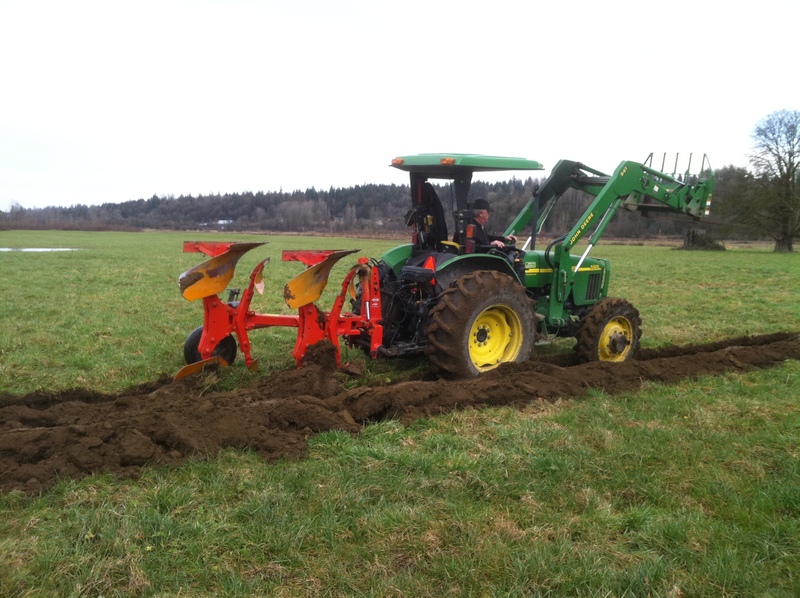 The disking and tilling are done with our bigger tractor, which has a rotating shaft (PTO, or power take-off) on the back that powers moving implements like the tiller. Once that smooth bed surface has been created, we’re just about ready to plant, and we switch to a smaller tractor with narrower tires to do the rest of the work. I know Jason is keen to write more about our shiny new red Farmall Cub tractor, so I won’t spoil his fun by describing all the cool tricks that it can do. I’ll conclude by saying that there are lots of other ways to get soil ready for planting. “No-till” farming has gotten some attention in the news lately, and can be useful in preventing soil erosion in places where farmers have traditionally plowed in the fall, allowing winter wind and rain to carry away the topsoil. Some farmers achieve a no-till system by knocking over the grass or cover crop that is growing with a tool called a crimper, which pinches the stalks in a way that kills them but leaves them on the surface. Then, small furrows are opened in the debris-covered surface, and the crop seeds are planted in that narrow band. This is a really cool system, and works well for things like corn that sprout and get tall quickly. Other no-till farmers kill the grass or weeds prior to planting by spraying the whole field with Roundup. This is not so cool, but I won’t get any further into it with this post. 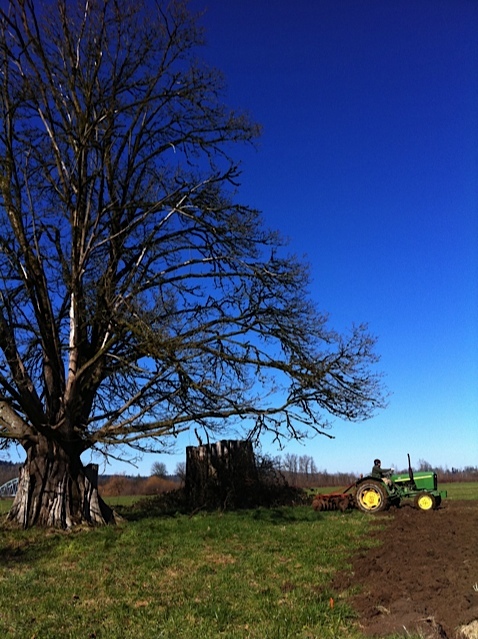 As for us, we’ll have to wait for it to stop snowing before we do any more tractor work on our farm…. Thank you so much for coming to QAE, Siri . . . it was a great education for all of us. The kids are clamoring for a field trip to the farm.